Thursday 14th June was the Alzheimers Society’s Cup Cake Fundraising Day. This was a national event. So Jacqueline Oliver and Bernice Mills baked some cupcakes to donate to the Grange Nursing Home, who were raising funds for this very worthy cause. 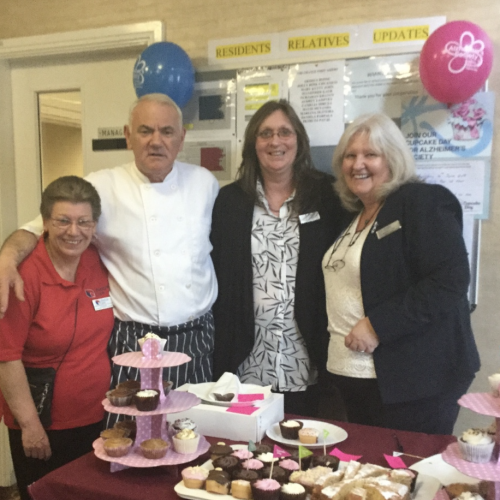 They then joined Debbie, the Activities Coordinator and her colleagues at the Grange Nursing Home to sell cakes to residents, their families, the staff and even some delivery drivers! Everyone had a great time and £115.00 was raised from everyone’s efforts. We look forward to working with The Grange Care Home on future fund raising events.